We describe the physical mechanism for the heat transfer coefficient in a turbulent boundary layer because most aerospace vehicle applications have turbulent boundary layers. The treatment closely follows that in Eckert and Drake (1959). Very near the wall, the fluid motion is smooth and laminar, and molecular conduction and shear are important. The shear stress, , at a plane is given by (where is the dynamic viscosity), and the heat flux by . The latter is the same expression that was used for a solid. 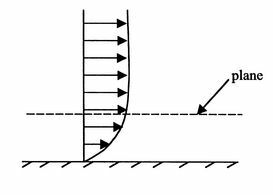 The boundary layer is a region in which the velocity is lower than the free stream as shown in Figures 17.2 and 17.3. In a turbulent boundary layer, the dominant mechanisms of shear stress and heat transfer change in nature as one moves away from the wall. As one moves away from the wall (but still in the boundary layer), the flow is turbulent. The fluid particles move in random directions and the transfer of momentum and energy is mainly through interchange of fluid particles, shown schematically in Figure 17.4. With reference to Figure 17.4, because of the turbulent velocity field, a fluid mass penetrates the plane per unit time and unit area. In steady flow, the same amount crosses from the other side. Fluid moving up transports heat . Fluid moving down transports downwards. If , there is a turbulent downwards heat flow , given by , that results. since the locations of planes 1-1 and 2-2 are arbitrary. where is the kinematic viscosity, and is the thermal diffusivity. The quantity is known as the Prandtl number ( ), after the man who first presented the idea of the boundary layer and was one of the pioneers of modern fluid mechanics. For gases, Prandtl numbers are in fact close to unity and for air at room temperature. The Prandtl number varies little over a wide range of temperatures: approximately 3% from 300-2000 K.
where and are assumed constant. Equations (17.18) and (17.19) show that to decrease the power dissipated, we need to decrease , which can be accomplished by increasing the cross-sectional area. Two possible heat exchanger configurations are sketched in Figure 17.5; the one on the right will have a lower loss. The Reynolds analogy can be used to give information about scaling of various effects as well as initial estimates for heat transfer. 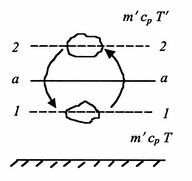 It is emphasized that it is a useful tool based on a hypothesis about the mechanism of heat transfer and shear stress and not a physical law.